Rats are socially unacceptable rodents. They contaminate food, spread disease and are linked to unsanitary conditions. When rats set up shop in your backyard, any plants, fruits and vegetables you are growing may be affected. 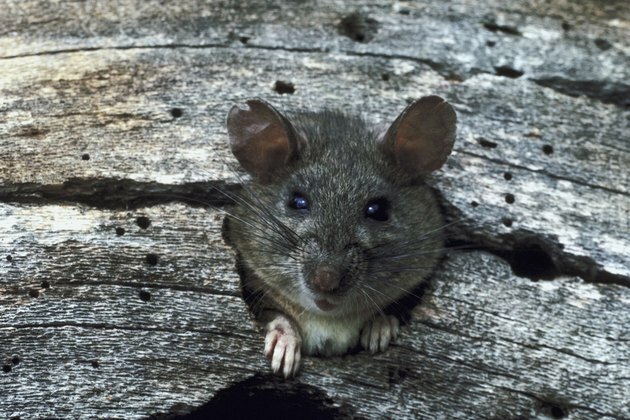 Rats seek food, water and shelter and may even gnaw their way inside your home. To combat a rat infestation in your backyard, you must make the area unattractive to them. Additionally, you can trap and kill the critters to get rid of them. Remove outdoor wood piles, because they can serve as shelter or a nesting site. Place trash in garbage cans with tight-fitting covers to keep rats from rummaging through your outdoor trash to look for food. Feed pets indoors, because pet food left outdoors can attract rats. If you must feed your pet outdoors, have it eat the food immediately, and take the bowl away as soon as your pet is done. Avoid using bird feeders to attract birds, because you may also attract rats. Use rodent-proof bird feeders if you want to feed the birds. Set out at least 12 snap traps. Bait the traps with dried fruit or bacon. Place the traps at least 10 feet apart in areas where you find rat droppings. Place them close to walls or burrows, near possible nest sites and rat travel routes. Check the traps daily, but don't expect to instantly find trapped rats. Rats initially avoid suspicious, new objects. It may take up to three days before you start trapping them. Put on disposable gloves and remove the rats from the traps. Seal them in a plastic bag and discard them in the trash outdoors. Bait the trap and reuse it. Double the amount of traps you use if most of your traps are successful. Use ready-to-use poisonous bait as an alternative to snap traps. Place the bait in areas where you believe rats will travel, near burros, walls and nest sites. Ready-to-use, commercial bait instantly kills the rats, or triggers fatal internal bleeding after approximately six days. Put on disposable gloves. Drape a plastic bag over your hand and forearm and collect the dead rats in your backyard. Discard them in a sealed plastic bag in the trash outdoors.